Summary - The JAL Credit Card is issued by National Bank of Omaha, just like the ANA credit card. This card is targeted at people who either fly a lot to Japan via JAL or Japanese expatriates living in the US who fly home once every couple of years. There are two versions of the card, with different annual fees and rewards. But as you'll find out, this card really is not up to standards and we will show you a better card to earn JAL miles. 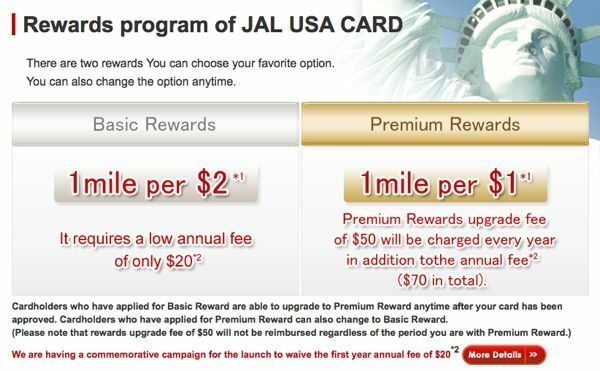 Basic Rewards - As we just mentioned, there are two versions of the JAL MasterCard. The most basic version is what they call the "Basic Rewards" version. This card allows you to earn one mile for every two dollars that you spend on the card. It comes with a $20 annual fee. Premium Rewards - The upper version is the "Premium Rewards", whereby cardholders can earn one mile for every dollar that you spend on the card. There is an additional $50 annual fee that you have to pay for the "premium rewards", making your total annual fee $70. From now till 30th November 2011, JAL is offering some special bonus for new cardholders. Basic Rewards Annual Fee Waived For First Year - Cardholders will have their basic rewards annual fee waived for the first year. That means that if you choose the "basic rewards" version, you will not have to pay the $20 annual fee the first year. If you choose the "premium rewards" version, the first year annual fee is only $50 as the $20 "basic rewards" fee is waived. Bonus Miles - Boy, do we have something interesting here. This card will let you earn 5,000 bonus miles after you fly your first international flight! Yes, you've read it right. You actually need to fly (international) for you to earn this bonus. The flight has to be booked and flown by 11th November 2011. 10% Sector Bonus Miles For Every Flight - Cardholders will get 10% Sector Bonus Miles for every eligible flight that they take with JAL (and paid by the credit card). 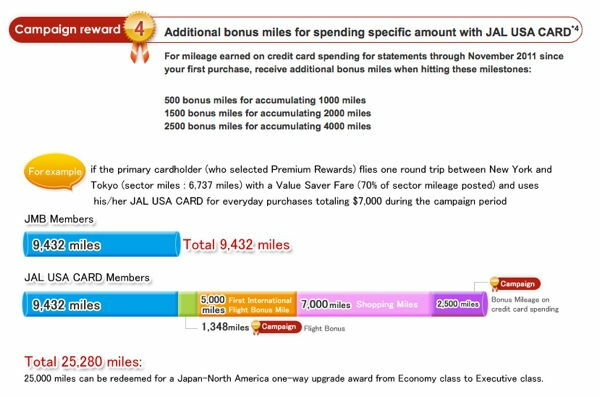 Extra Bonus Miles For Achieving Certain Spending Levels - JAL is also offering bonus miles based on how much you spend. You will earn 500 miles after you earn 1,000 miles on the card, 1,500 bonus miles when you earn 2,000 miles and 2,500 miles when you earn 4,000 miles. The spending needed to earn those miles depend on which card you choose. So for example, if you choose the basic rewards version, you need to spend $2,000 to earn 1,000 miles, which will then get you an additional 500 miles. If you have the "premium rewards" version, you only need to spend $1,000 to earn 1,000 miles and get the 500 bonus miles. JAL has given an example whereby you buy a ticket from New York to Tokyo, together with some spending on your card, can get your over 25,000 miles, which gets you an upgrade from economy to executive class for your next US Japan flight. I don't really know where to start with this one. It seems that many international carriers who issue US based credit cards have a lot less features. For example, a typical US based airline will charge an annual fee for their credit cards and allow you to earn double miles when you use the card to buy their tickets. They might throw in other benefits like free baggage fee (that international airlines typically do not charge), priority boarding, lounge access and ability to earn elite miles. But many international carriers have cards without these features. But having said that, having to pay an annual fee and not allow cardholders to earn double miles on their airline ticket purchase puts this card way at the bottom of it's class. This is also the only card I know where you actually have to pay for a fly a US to Japan flight to earn a measly 5,000 bonus miles! If you fly via JAL to Japan a lot, or perhaps you have moved from Japan to the US, you'll probably be a little upset to find out that your favorite airline has an affinity card that lags behind what US carrier cards pay in rewards. You probably appreciate that fact that JAL has better service than US carriers, but are frustrated (especially after this review) about the card. Thankfully, I'll offer you a way out of this. And the way out of this is to get the Starwood Preferred Guest Credit Card. Why? Because you can transfer starpoints to JMB miles at a one for one ratio. Furthermore, each time you transfer 20,000 points, you get 5,000 bonus miles. It also has a lower annual fee $65 (lower than the premium rewards version), and waived for the first year. Starwood credit card holders can also transfer points to over 30 airline partners, including ANA. They also offer a much more generous bonus miles without requiring you to actually buy a US Japan ticket! Conclusion - For some reason, the two major Japanese Airlines, ANA and JAL seem to have the worst credit cards. I though the ANA card was bad. But the JAL is even worse. You have to pay an annual fee and yet cannot earn double miles. You also need to actually book an international flight to earn your 5,000 bonus miles. Yes, you do earn an additional 10% bonus sector miles. But in all honesty, if you want to earn JMB miles, I would suggest you get the Starwood Preferred Guest Credit Card instead. You get a card with a lower annual fee than the "premium rewards" version and you can transfer points not just to JAL but to ANA as well.